In northern Uganda, where women face gender discrimination and gender-based violence, Agnes Atim Apea is empowering women to fight against these burdens and helping them generate income to support themselves and their families. 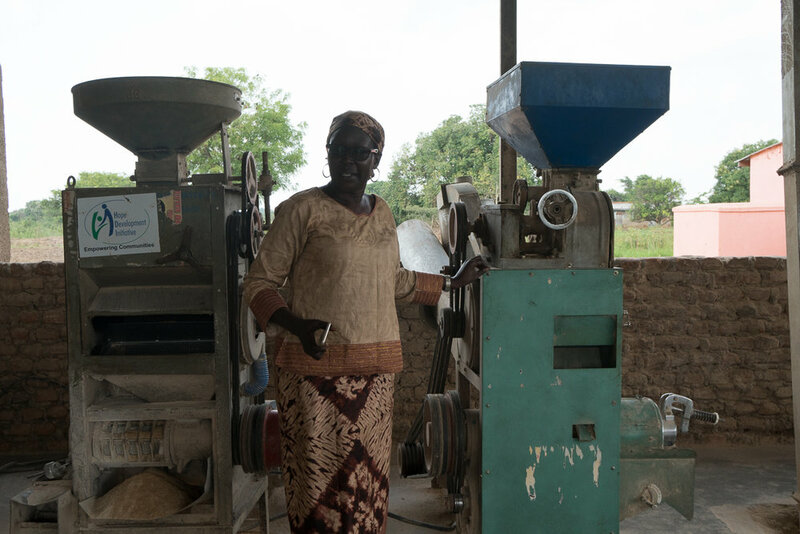 Agnes is the CEO of Hope Development Initiative (HDI), a women’s rice cooperative in post-war northern Uganda. Like many of the women who are victims of the war, Agnes spent 20 years growing up in Internally Displaced Camps where there was no food or economic activity. Hoping to empower the large population of women in similar situations, Agnes formed a business minded cooperative that works entirely with women. Today, HDI has 8,900 members and rice farming is a source of income for these women in four neighboring districts. The US African Development Foundation (USADF) partnered with HDI in 2012 to help the community project implement training programs and technical assistance, and fund a tractor. After USADF funded the first tractor, HDI then re-invested their profits to buy a second. They are able to rent out these tractors to other famers, which in turn offsets the costs. Agnes says the technical assistance that USADF provided helped them manage their systems and develop a relationship with the district. HDI was able to instill a sense of business in the women, enabling them to view their work as a commercial enterprise, not just subsistence farming. Katie Obote joined the cooperative in 2013 and farms rice on 10 acres of land. Before joining HDI, she had little success with the crops she grew, which include sesame, millet and maize. Three years later, Katie has experienced improvements in her life and community since joining HDI. Last year, she bought land with her own savings, plowed 10 acres, benefitted from HDI organized training, and has an increase in rice production. She gets 200 bags of 100K rice and earns 2,500 UGX per kilo for milled rice. With her increase in profits, Katie bought cows, oxen to plow, and a motorcycle, and provides her family with better access to healthcare. Mary Marukera, cooperative member since 2012, has similar improvements to Katie thanks to the partnership between HDI and USADF. Mary began with 0.5 acres of land where she would grow rice and sell it to the cooperative. After five years of rice farming, she now has over 40 acres of land with her family. “My dream came true,” Mary said. With her new income and savings, she is building a new house, bought cows, invested in four ox plows, can send her 10 children to school, and can feed her family. But Mary’s success will only continue to bring change and prosperity for both her family and the local community. Not only does she plan to increase her land and farming activities, but she hopes to buy land to run a small hotel in town. USADF helped HDI develop sustainable business methods to continue expansion and increase profit. As they prove that farming can be a business, Agnes says the community no longer needs loans or donations, but business. The cooperative sells their rice in Uganda, Kenya and South Sudan, and women are seeing their dreams come to life. Four years ago, cooperative member Rebecca imagined and dreamed of having the savings to build a 2-bedroom permanent house with a tin roof. Today, thanks to her membership with HDI, she is realizing that goal and building her dream house. USADF is committed to sponsoring African-led projects that create community-level connections and are driven by the community. USADF works to transform post-conflict communities with local enterprise development. HDI not only helps their members attain improved access to healthcare and training for optimum production, but also has a long-lasting community impact. Their resources help fight poverty and hunger for their local community, and with the capacity building enhanced through USADF, their impact will only continue to grow.